OSWEGO, NY – The Oswego Tree Stewards are looking for more volunteer citizen pruners. Pictured is Sally Kellog from DEC awarding Oswego Tree Stewards Valerie Dawnstar, June and Phil MacArthur, Tree City USA in Albany. 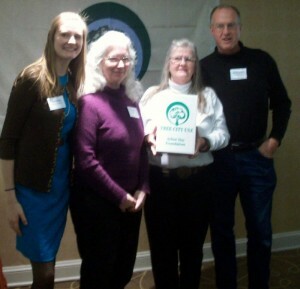 On March 28, Phil and June MacArthur and Valerie Dawnstar, all volunteer tree stewards went to Albany to accept an award from Arbor Day Foundation for Oswego becoming a Tree City USA. Part of the award was for creating a volunteer citizen pruners program, creating a tree ordinance for the city and helping to make the city aware of the importance of our urban canopy. You can see what the Oswego Tree Stewards are doing by looking on Facebook and friending them under Oswego Tree Stewards. They have started their “Saturdays on the Streets” and you’re welcome to come join them and learn about the importance of citizen tree stewards. 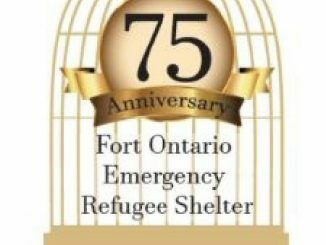 Many of the volunteers are retired and will tell you what fun the group is. Oswego Tree Stewards work on the city’s young trees and you will learn about the four Ds of tree trimming – dead, diseased, damaged, or deranged limbs. The pruning that is done for a city tree is for the health of the tree, to make the trees stronger and for the trees to live longer. It’s a great way for you to learn how to take care of your own trees on your own property. The city trees can only be trimmed authorized trimmers, the city DPW crew or Oswego Tree Stewards after training. You don’t have to be a muscle jock to become a tree steward! You just have to be steady on your feet and like doing gardening or walking. You work in small groups with other tree stewards learning much about tree identification, tree biology, tree pruning and care. The two safety rules are both feet on the ground and no power tools. Once you begin working with these other tree loving volunteers, walking the city of Oswego will never be the same. Give a call to Phil or June MacArthur, 342-9130; and leave a message if they doesn’t answer, they’re probably out trimming a tree.